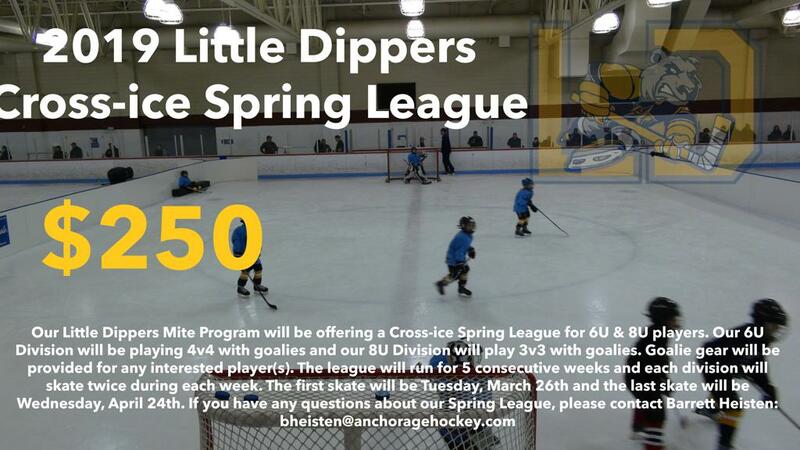 Little Dippers 6U/8U Spring League Online Registration will be available shortly. AHAs Little Dippers Mite Program will be offering a 5 week Cross-ice Spring League for 6U (2013-2014) Division and 8U (2011-2012) Division. The first skate will be Tuesday, March 26th and the last skate will be Wednesday, April 24th. All skates will take place at Dempsey Anderson Ice Arena. Our 6U division will play a 4v4 cross-ice game with goalies and our 8U will play 3v3 cross-ice game with goalies. We will have goalie gear available each skate for any interested player(s) to use. We will not have set rosters for both division. We feel its important for kids to get an opportunity to play with and against other players. On the first skate each week, we will move kids around and have new rostered teams for that week. ©2019 Anchorage Hockey Association / SportsEngine. All Rights Reserved.